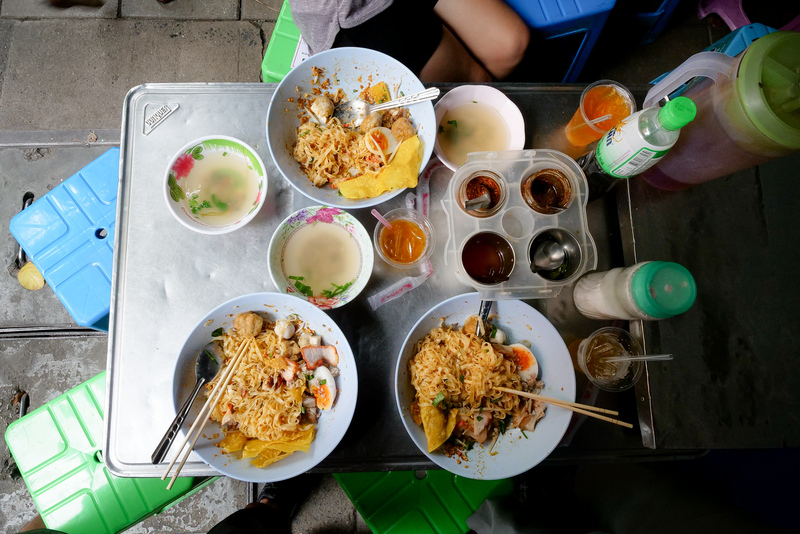 Kuay Teow Khae (ร้านก๋วยเตี๋ยวแคะ) is an extremely popular Thai street food noodle stall in downtown Silom, Bangkok. 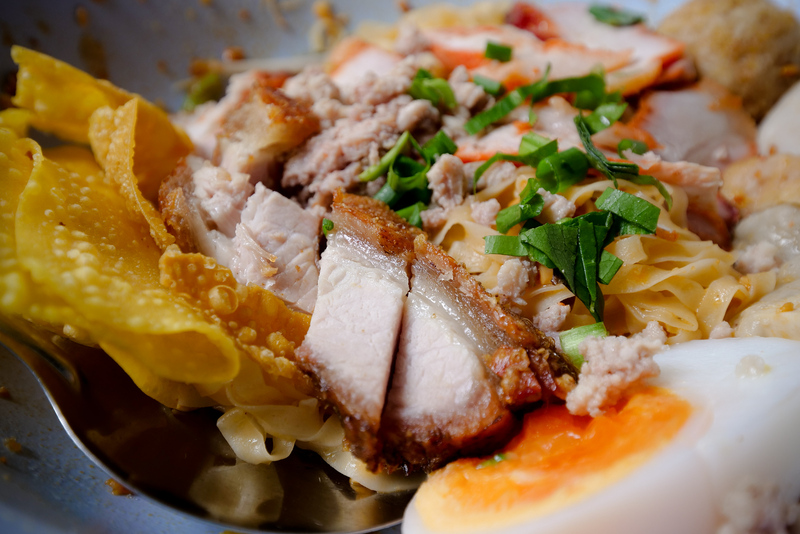 The egg noodles are crinkly, the seasoning is spicy and sour, and the crispy pork belly will crunch and melt in your mouth at the same time. 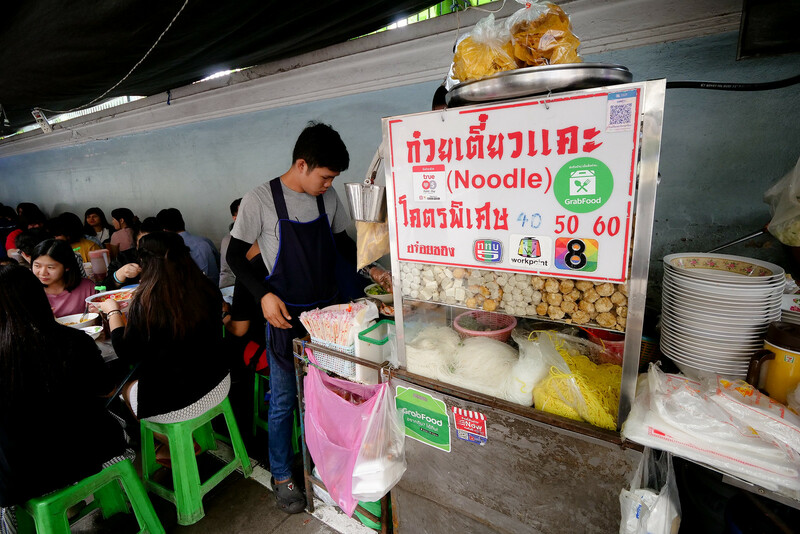 When you’re in Silom at lunchtime, here are all the details you need to eat an amazing bowl of noodles at this packed street food stall. Because of the huge office lunch rush, Silom has no shortage of excellent lunchtime Thai street food stalls. 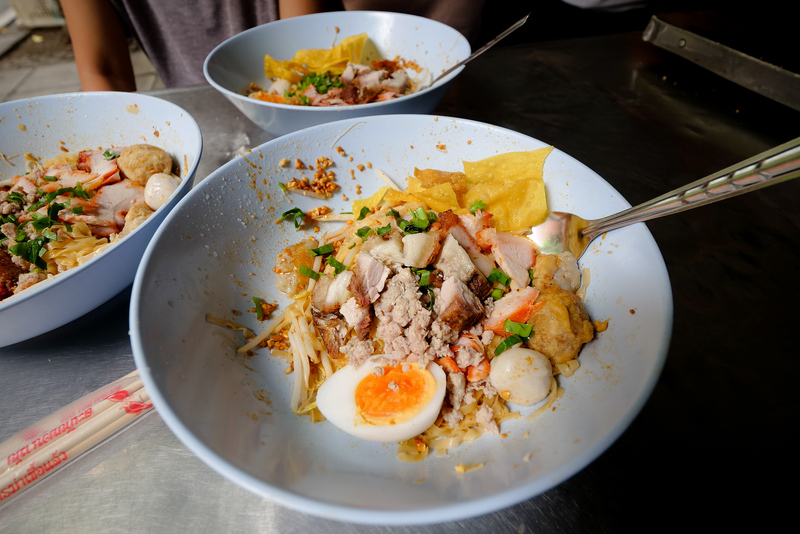 You’ll find everything, from rice and curry to amazing green papaya salad, to popular bowls of noodles. The stall is called Kuay Teow Khae (ร้านก๋วยเตี๋ยวแคะ) and it sets up along Soi Convent, right in the heart of Silom (just down the street from Sala Daeng BTS station) for lunch. They offer big portions for a decent price, and in my opinion it’s one of the tastiest lunchtime bowls of Thai noodles in Silom as well. If you go right at 12 noon all the tables along the sidewalk will be full and there will likely already be a crowd waiting for a table. So if you have a flexible schedule, it can be wise to arrive about 11:30 am, or before, so you don’t have to wait too long. Last time I ate here I was with Drew, and we arrived just before Noon I think, and we did end up waiting about 30 minutes before being seated. It was well worth it though! That’s what I ordered and that’s all I’ve ever ordered. They do have smaller sized bowls, 40 Baht, 50 Baht, and 60 Baht. And you also have the option to choose from a variety of different Thai noodles, all displayed in the cabinet in the cart. But this is not the type of Bangkok street food stall where you want to skimp or cheat yourself. You’ll want to order the full 60 Baht largest size, with all the toppings. The dry egg noodles special (ต้มยำแห้งเส้นโซบะ พิเศษ tom yum haeng sen soba pisayt) is the dish I automatically order. It comes with wide crinkly egg noodles on the bottom, which are first blanched. Then goes on a variety of seasoning sauces and oils like pork lard fried garlic, chili flakes, and crushed peanuts. Followed by red bbq pork, minced pork, half a hard boiled egg, a pork meatball (which sometimes gets hidden beneath other toppings), beansprouts, crunchy wonton wrappers, a couple dumplings, and finally a handful of golden crispy fried pork belly – I might have missed a few things? When you order your noodles dry (แห้ง haeng), you will still get your soup on the side in a bowl, as opposed to soup within you bowl of noodles. I prefer the dry version so that my noodles don’t get soggy and saturated as I’m eating. Plus the dry version means that all the flavor and seasoning doesn’t get watered down in the soup. The pork belly just shines on top of your bowl. There’s another stall in Bangkok called Ko Boo Rossing Noodle (ร้านโกบู้รสซิ่ง) which serves a similar version of dry tom yum egg noodles, both are excellent. 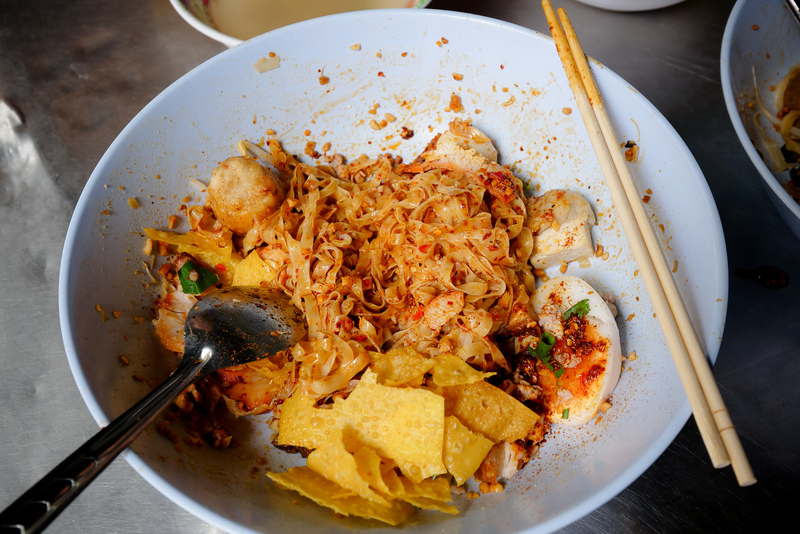 Like with any bowl of Thai street food noodles you eat, it’s a good idea to taste test before you add seasoning. At Kuay Teow Khae (ร้านก๋วยเตี๋ยวแคะ), they actually do a great job of including plenty of seasoning – chili flakes, a sprinkle of sugar, garlic fried lard, and plenty of peanuts. For some it may be already perfectly seasoned. However, they do include omnipresent Thai noodle seasonings on you table, and they are meant to be used at your desire. I usually add about 2 – 3 extra spoons of chili flakes and the same amount of vinegar. As I’m eating through the tangly noodles, crunchy wontons and juicy pork belly, I sometimes add a spoonful of the soup to my noodles to rehydrate them as I go. The balance of sour, spicy, sweet, plus all textures sandwiched within each chopstick mouthful, makes this bowl of noodles extremely tasty and special. Kuay Teow Khae (ร้านก๋วยเตี๋ยวแคะ) is a Bangkok street food stall that’s well worth seeking out when you’re in Silom during lunch. Great video! May I know what is the opening hour for this stall please? Thabk you for introducing all these marvously food! Hi Mark, great to see updates again. We are heading to Thailand and this is great timing. My son Liam follows you but unfortunately he just had a brain op and will miss out on the trip – Mom will have to stay behind as well. He is really sad because I think he arranged to meet you in BKK. It is now just me and my daughter. Keep posting!! Mark, I absolutely love your work. Please tell Ying that I am curious to know what Ying’s favourite food places are in BKK/Thailand are, is it possible for her to want to share this with us? If she (or yourself) was ever to make blog, or a video “Ying’s Tour” or “Ying’s top 5” or the like, I think that would be a very interesting list to see!! Or possibly, even Ying’s mum.. being the cook that she is and the knowledge of Thai cooking she holds, I imagine her perspective on a few restaurants to be very valuable. Thank you, and keep on sharing the food-love. Mark I love to watch you guys eat! I have a Thai medical resident who works with me and she loves you too. just hope she doesn’t decide to return to Thailand and leave us. Thanks for all the great videos. Another great food video with some of my favourite dishes khao man khai and anything pork and noodles moo grob and moo daeng.I like chilli but would use only ten percent of what Mark uses, Keep up the good work. Hello from Sweden. Awsome to have you back posting and blogging Mark.Ive surely missed that.Love BKK and Thailand and totally love your way of presenting the wonderful,sparkling thai streetfood cuisine. Thank you and keep up the good work. Mark I love watching all your videos and look forward to new ones. Its been only a month since I discovered your channel but so addicted. You need to come again to Kenya. I would love to eat with you. I also love the fact that Ying and yourself take Micah along everywhere. Thank you very much Anisha, really appreciate your support. Would love to visit Kenya again! Hi, for the same videos, can I ask for the actual address for the “Uncle Tokyo” and the “Store” street food stalls located ?? I can’t search through Google Maps but only Kuay Teow Khae and Yee Jay available for marking location. This looks great Mark, good to have you back in BKK. I’m always on the lookout for places that take their time to make their food from scratch i.e. homemade stocks instead of store bought, fresh squeezed limes instead of bottled juice. I’ve noticed an alarming trend over the last several years of more and more places cutting corners to save money. I would like to see reviews for places that still put in the effort to make their food “the old fashioned way”, from scratch. Thanks for another great new place to check out! Excellent! I am Thai living in Chicago. Glad to see yiur article. enjoyed it a lot. Great video! I’ve been missing your posts as well as Bangkok. Thank you very much Luke, lots more content coming! That was absolutely fantastic video and presentation one of my favorite dish of all time is amazing and so delicious. Thank you Mark. keep up the good work. Really appreciate it Nui, thank you for reading and watching! I’ll definitely give this place a go on my next visit in Jan19. How early are they open in the mornings for breakfast? Thank you Khoi! I haven’t been there other than for lunch, but they told me they open around 7 am, from Tuesday – Saturday. Thoroughly enjoyed this visit to Silom. The Kai man hai was a bonus. I miss Sukumvit and Silom. Thanks Robby, oh yah that khao man gai at the front of Soi Convent is quite good also. Missed your posts! Will definitely try this out when I am in Bangkok! I’m there in 3 weeks – is it there in the evening ? Hey Geaham, good to hear that. Unfortunately this is just a morning and lunch spot. Mark: Always enjoy your Bangkok street adventures. The Tom Yum Dry Noodles look great. I would love to see Bangkok again. Hey Sam, thanks a lot for reading. Will definitely let you know if I come up with a recipe. I saw this video of yours as I was searching for street food in Sri Lanka (go figure). Have you ever thought about doing on in the expat areas of Sukhumvit, from Phrom Phong to On-nut or shorter? I’m often looking for street noodles (usually ban mee) but I’ve only found a few spots that I like. Think it would be useful for lots of expats, especially since they started to close many street food stalls in the area from 2017. 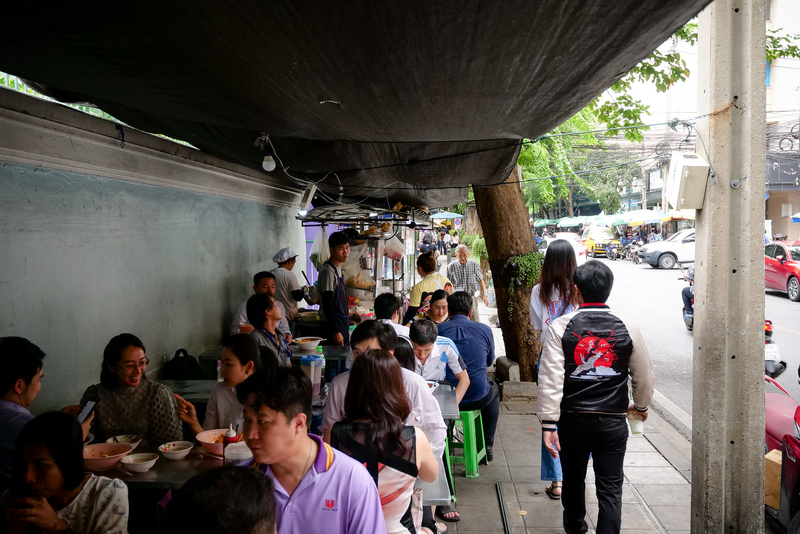 Lee’s noodle’s is my go to place in Thong Lor and there’s a place called Sangha noodles hidden in Soi 49 (family run, no web presence), seems when I ask people for more places they often struggle and only suggest higher end noodle shops. Hey Harvie, thank you very much. Yes, that’s a good idea though to cover some places that are very central and close to BTS stations. Thanks and hope you’re doing well.